Wall mounted hospital surgeon’s scrub unit (Franke model SSW) manufactured from grade 304 (18/10) stainless steel 1,6 mm thick with 150 mm high integral splash back to back, curved internal corners and 40 mm waste outlet/s (please refer to table below).This unit is available in four standard lengths being 1200, 1500, 1800 and 2100 mm.The front and sides of the unit has a double walled construction with a inner wall sprayed with vermin proof bitumastic sound deadening approximately 2 mm thick. 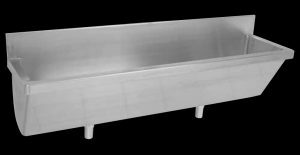 The wall mounted hospital surgeon’s scrub unit is fitted with a removable galvanized mild steel 2 mm thick fixing plate. Unit fixed to wall 900 mm high from the top of the front apron to the finish floor level with anchor bolts (bolts specified elsewhere). Installation:The height of the rim of the unit should be ±800 mm high. Similar to normal basin height. Wall mounted surgeon scrub up unit. 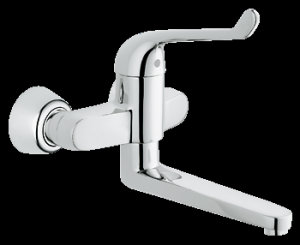 The number of taps to use depends on the length of the unit. Taps and plumbing is not included. Top view of scrub unit. 1200 mm – 2100 mm lengths available. Wall mounting plate supplied with the unit. Please note: This is a non-stock item. All orders have a lead time of ±26 working days. When requesting a quote, please specify the product codes as listed in the tables below.